For 56 years, top sailors from around the planet have gathered to race in Harbor Springs for a friendly but competitive endnote to the big Mackinac regattas. Check our primer to this sailing weekend that is curiously both off the radar and legendary … and head over to see the sails during the Ugotta Regatta July 28 to July 31! For 56 years now, Little Traverse Bay Yacht Club has hosted the Ugotta Regatta immediately following the famed Chicago to Mackinac and Port Huron to Mackinac races in July. With top sailors already in the area for those headliner regattas, the Harbor Springs Ugotta is able to draw some of the best crews in the country. One-design races on Thursday and Friday, followed by Tour of the Bay events on Saturday and Sunday, bring hundreds more sailing enthusiasts to town. Bragging rights are worth more than trophies, and skill-sets range from paid pros on big boats to hack teams of pals looking for annual excuses to play on the water for the whole weekend. The race’s roots go back even beyond those 56 years, to the World War I-era, when Little Traverse Bay served as a substitute destination for the Chicago Yacht Club’s Chicago to Mackinac Island race. At times, the Ugotta has served as the National Championship sailing competition. Boats can range from 20-some feet to upward of 80 feet. Famous race boats like Roy Disney’s Pyewacket have made appearances, and sailors with résumés that include America’s Cups, Volvo Around the World Ocean Races and more count the regatta as a favorite event each year. The weekend has long inspired artists, with sailing scenes painted a thousand times over (we love local takes from Trisha Witty and Mary Hramiec Hoffman). Lilly Pulitzer even designed the “Ugotta” print as an ode to the race. Little Traverse Yacht Club was founded in 1895, so it’s no surprise the Ugotta Regatta serves as one of the longest standing sailing traditions in the Midwest. The yacht club itself, located on Bay Street along the waterfront in downtown Harbor Springs, boasts plenty of memorabilia from Regattas past (oh, those 70s styles! ), as does the Local History Gallery of the Harbor Springs History Museum. The harbor that gives Harbor Springs half its name is the deepest and one of the most protected shelters in all the Great Lakes, tucked, as it is, into the northern rim of Little Traverse Bay. But the moment sailors cruise around the curved Harbor Point and push into open water, conditions can go from glass flat to surging six footers. For sailors, of course, that’s a marvelous situation, because wind and waves are what they seek, and what top sailors love about this area is that wind is reliable, thanks to the grace of good geography. Little Traverse Bay and its environs have terrain tailor-made to produce wind. And Little Traverse Bay doesn’t have just any ol’ wind. The region is known for killer thermals, aka a lake sailor’s dream come true. There are many fancy, scientific descriptions of thermal wind, but the simple explanation goes something like this: land heats up under the summer sun, while the water temperature remains relatively cool. The warming inland air begins to rise from the slopes, bluffs and rolling hills of the greater Harbor Springs area, and as the air rises, it pulls in chilly air off the lake. As this happens, a solid breeze builds throughout the morning and into early afternoon. Call it Mother Nature’s wind machine. Call it happy sailing. Norm Berge could probably scale a boat mast before he could walk. His dad hails from New Zealand—capital of the global sailing community—but Norm grew up on the waters of Lake Charlevoix and Little Traverse Bay. He’s a poster child for being raised in boats, Up North. Berge’s official sailing education began at age 11 with the Lake Charlevoix Mariners and continued on with the Little Traverse Sailors’ Junior Race Team. As an instructor for the program, he was building a love of sailing in the next generation before even graduating out of the teenage years. “Sailing on Little Traverse Bay allowed me to gain a whole lot of opportunities to be on bigger boats,” Berge says of his early years in the sport. This is partly because the elder statesmen around town play a big role in keeping the sport alive. Guys like Dave Irish—who has unending win lists and sailing accomplishments, including serving as president of U.S. Sailing and vice president of World Sailing (the globe’s governing body of the sport)—invite kids like Berge to sail and learn alongside them. From weekly race series opportunities to regatta crews, kids in Northern Michigan who want to sail can usually find a way aboard a boat. “I did it as much as possible, and still do,” Berge says. He’s been doing a lot of one-design keelboat racing with various teams, but notes the Little Traverse Yacht Club’s annual weekend-long race will always be a favorite. “It’s the big hometown regatta. You get to sail with and against your friends. That never gets old,” Berge says. Land lubbers can catch regatta fever, too, thanks to these great spectator spots along Little Traverse Bay. This year’s Ugotta Regatta happens July 28 thru 31. Petoskey: Cruise the breakwall to see the full fleet moving up and down Little Traverse Bay. Expect a scene of coordinated chaos. Petoskey State Park’s panoramic horizon goes technicolor during the Saturday and Sunday “Tour of the Bay” races, which generally run from about 10 a.m. to 4 p.m. Spinnakers fly from west to east, so the beach is best for a long range view. Harbor Springs: The Harbor Springs Municipal Docks host most of the regatta boats and their sailors. It’s also the place to be after races. Watch crews dry out their sails, fix what got busted and more. Sailors are a friendly bunch by nature, willing to chat about everything from hull designs to what all those crazy little yacht flags represent. Plus, walking through a forest of metal masts is pretty cool. Pro tip: Dudley’s Deck at the Pier Restaurant, alongside the marina, makes a perfect place to dine amid the action. Zoll Street Beach and the Harbor Springs bluff are good spots to witness upward of 88 boats make their way to the starting line. Get downtown early and hit the Little Traverse Sailors Junior Race Team pancake breakfast, held every year at the Little Traverse Yacht Club. On the water: Adventurous folks can rent kayaks or paddleboards from The Outfitter in Harbor Springs and tool alongside the boats as they head in or out of the harbor. Know that the big lake can be choppy, and race rules prevent non-race boats from getting too close to the action. But waterline views of crews scrambling at the gun—or exhausted at the end of a long day—make it clear: regatta sailing is serious business … unless there’s no wind. (Yes, sometimes even the Little Traverse Bay wind machine does run out of power.) If that’s the case, be prepared for antics ranging from swan dives to boat-to-boat frisbee. The sport requires brainpower, finesse and technological understanding; all of these functions are easily accomplished by both sexes. “Other than some positions on huge boats that require pure strength, women are able (and expected) to compete on an even playing field,” Schoenherr says about today’s women, who have proven they can crew and captain with the best. To honor this, Little Traverse Yacht Club started the Women’s Regatta for the Diane Chapin Nilstoft Memorial Trophy in 2015. Nilstoft, who died of cancer in 2010, was the epitome of a great sailor. She won numerous Mackinac races and skippered her way to a first overall finish in the Mills Trophy Race, a prestigious event run by the Toledo Yacht Club. Held a week after the Ugotta Regatta, the set of women’s races celebrate people like Nilstoft, who love to harness the wind. The first year saw 55 women participate, including 20 junior sailors. Those numbers are expected to grow by 20 or more in 2016. “It’s empowering to be on a boat that’s skippered and crewed by women, especially because some female sailors are still intimidated by men on boats. It became apparent right away this would be a very popular new tradition.” Schoenherr says. It’s an item more coveted than a World Series trophy in this neck of the woods: the annual Ugotta Regatta T-shirt. Not just for sailors, the T-shirt design is never revealed before race weekend. Nabbing one means way more than collecting a hip piece of clothing. The T is like a billboard proving you know local secrets. Get to Irish Boat Shop early on Friday morning, because each year’s design goes fast. T-shirt sales usually start at 8 a.m., but the line is long by 7:45 a.m. 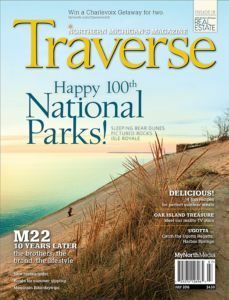 This article was originally published in the July 2016 issue of Traverse, Northern Michigan’s Magazine. Kate Bassett writes from Harbor Springs, where she is news director at the Harbor Light. Her first novel, Words and Their Meanings, is available in bookstores and online. All photos by Andy Wakeman.